Edward Whatley has produced a stunning cover to accompany his artwork for 'Atomic Control' and there's a good chance it'll be used for the front cover of 100% Biodegradable itself! It's a twist on the old horror / mystery comics, but using several sci-fi elements and characters from the 'Atomic Control' story itself. I think you'll agree, it's a fantastic piece of artwork. My story 'All Along The Watchtower' has just been released! With fantastically trippy artwork by David Snell, it's included in the very first issue of Sliced Quarterly, a new experimental comic anthology. If 2014 was about writing my first book, then 2015 was thankfully about finishing it. After the final edits were completed in summer and with no real success at finding an ebook publisher, I quickly made the decision to self-publish. For anyone toying with the idea of self-publishing, it really isn’t as difficult as you might think. It’s a major reason why, in recent years, there’s been a 400% increase in self-published books, an area that now accounts for 40% of the market. I chose Amazon Kindle for initial publication, followed by Createspace a short time later for the paperback version. Each process was very user friendly, needing some changes to the MS Word formatting and of course, an eye catching cover! Step forward Trystan Mitchell. Trys managed to produce a stunning cover for me, perfectly fitting with both the style and the market I was looking for. And so that was it. One click and I was officially an author on Amazon! 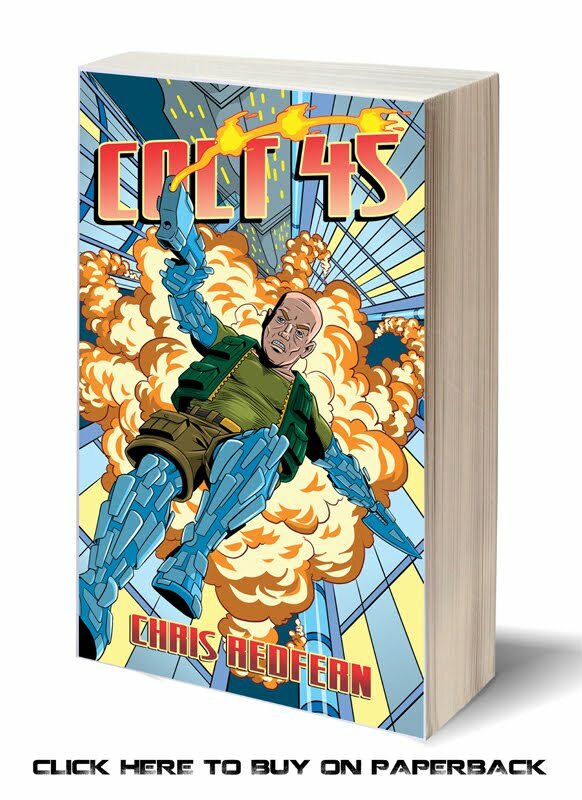 So, after almost two years of dedicating the major share of my writing focus towards the book, COLT-45 is finally out there and the sense of achievement is massive. I’ve already been asked if there might be a follow up, but unfortunately my new job is extremely demanding and it’s left me with little free time. However, I do have several ideas simmering away, one of them even started, but it might be a while before anything sees print this time around. I also had a couple comic scripts published in 2015, ones rolled over from the year before. ‘It’s a Dirty Job’ became my first story to be published in a National magazine, appearing in the March edition of SCREAM and featuring the artwork of Paul McCallan. Secondly was ‘Timepoint’, again with Trystan Mitchell, which was printed in ‘The Psychedelic Journal of Time Travel’ and launched at Thought Bubble in November. Finally, as Christmas was approaching, I decided to send a piece of flash fiction to a new website with the hope of it sitting in their slush pile for a few months. Imagine my surprise when Friday Flash Fiction published ‘Arise Ovis Aries’ only a few days later. A good result to end the year with. So, what does 2016 hold? 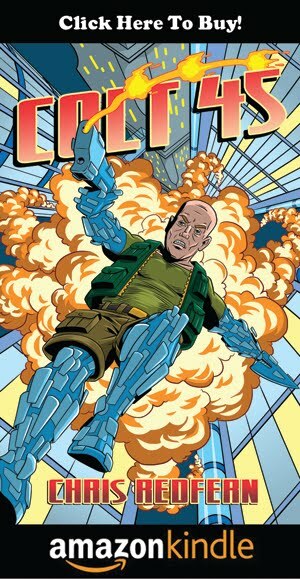 ‘Desperate Measures’ with Edward Whatley will see print by publishers Grayhaven Comics in the coming months. ‘All Along the Watchtower’ with David Snell will be a part of the launch issue of Sliced Quarterly and ‘Atomic Control’ will showcase EdwardWhatley’s best artwork to date within the forthcoming pages of 100% Biodegradable. With regards to ‘Next of Kin', Pete Woods has completed some incredible artwork and we're currently looking at where to go with in next.